Trailers and TV Spots for The Dark Knight Rises have been coming at rapid fire succession for the past few weeks. One would think it possible to piece together the entire film with all the footage that has been revealed thus far. Yet, the barrage has no signs of slowing down. An exclusive Nokia trailer for The Dark Knight Rises appeared online earlier today. Those hoping for more spoilers and secrets will be sorely disappointed, as it offers nothing that previous trailers haven’t. It does, however, manage something much more subtle. It compiles elements of previous trailers and TV spots into a much more coherent narrative. It also lets the images speak for themselves, to the point where dialogue hardly seems necessary. A moment where Bane catches Batman’s fist in mid-air spells out the threat level of the film’s villain better than anything else that has been shown up until this point. The anarchic scenes of Police clashing with Bane’s mob in the streets of Gotham are startling in their scope. There also seems to be many more shots of Batman in broad daylight than ever before. As Devin Faraci pointed out over at Badass Digest, none of the trailers or TV spots offer a clear idea as to who Bane is or what his plans are. The marketing for the film has been playing it very close to the vest in that regard. By comparison, The Dark Knight surely had it the easiest out of all the films in Nolan’s trilogy as far these things go. The Joker is the most well-known comic book villain of all time. He requires no introduction to mass audiences, or explanation for that matter. 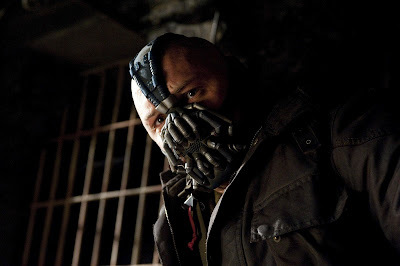 By contrast, Bane isn’t a household name as far as villains go, and the “Knightfall” story arc is much less well-known. It remains to be seen whether the mystery surrounding this character will intrigue audiences or turn them off. Thus far, the Marketing for The Dark Night Rises has struggled to give the public a clear idea of what the film is about without tipping its hand too far. Out of all the trailers that have been released, this one comes the closest to achieving that goal. The film has more action, more special effects, and more mystical philosophy than THE DARK KNIGHT, but less intelligence.